Kogen Kamahori, an ascetic priest, has undertaken the challenging "Sennichi-Kaiho-Gyo" 1,000-day marathon pilgrimage, which has been passed down in Hieizan Enryaku-ji Temple. 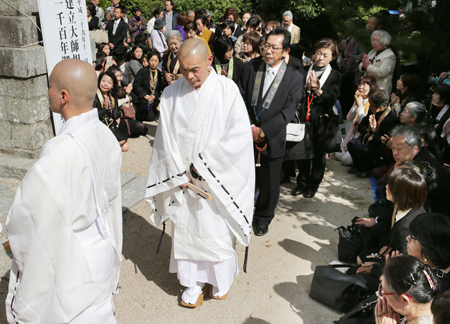 In the afternoon on October 13, the 41-year-old priest began the "Do-iri," regarded as the most rigorous part of the pilgrimage austerities. After entering Myo-o-do Temple located in Mudojidani, Sakamoto Honmachi, Otsu City, which commands Lake Biwa, the priest must stay there for nine days without food or water and not sleep, nor even lie down. If he successfully completes the ordeal, he will come out of the temple very early in the morning on October 21. It has been eight years since a priest has proceeded to this stage. 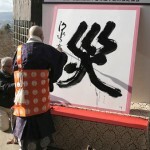 It takes seven years to complete the entire 1,000-day pilgrimage. 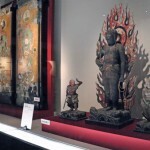 The stage of "Do-iri" is the ordeal where a priest, who has already finished the austerities of 700 days, strives to become united with the Fudo Myo-o deity. 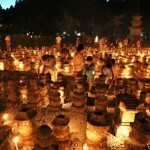 It is officially named "Myo-o-do Sanro," which means confining oneself inside Myo-o-do Temple to pray. The priest has to chant the Fudo sutra 100,000 times, and is allowed to leave the temple only to go to a nearby special well at 2:00 every morning and get water to offer to the principal image. From the fifth day on, the priest is allowed to rinse his mouth with water. This confinement ritual is called "a living funeral" as it is tremendously debilitating mentally and physically. 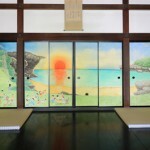 After a worshipful early morning walk in the mountains that day, Kamahori participated in a ritual called "Saijiki-no-gi," the last meal before seclusion, at Homan-in next to Myo-o-do just after noon. He did not eat anything from the table. Worshipers gathered early, waiting to see Kamahori in front of the temple. As approximately 350 people watched and prayed with their palms together for the success of his pilgrimage, Kamahori, clothed in white, appeared at around 1:00 p.m. With a tense look on his face, the priest entered the temple, led by five Dai-ajari great masters, who have already completed the marathon pilgrimage. Then, the temple's front doors were closed. Kamahori, the chief priest of Zenju-in Temple of Enryaku-ji Temple, was born in Fukuoka Prefecture. After becoming a priest in 1991, and graduating from the Eizan Gakuin college, he started his 1,000-day marathon pilgrimage in 2011.